Perhaps the most widely known of all discrete distribution is the binomial distribution. The binomial distribution has been used for hundreds of years. Several assumptions underlie the use of the binomial distribution. The experiment involves n identical trials. Each trial has only two possible outcomes denoted as success or failure. Each trial is independent of the previous trials. The terms p and q remain constant throughout the experiment, where p is the probability of getting a success on any one trial and q = (1 – p) is the probability of getting a failure on any one trial. 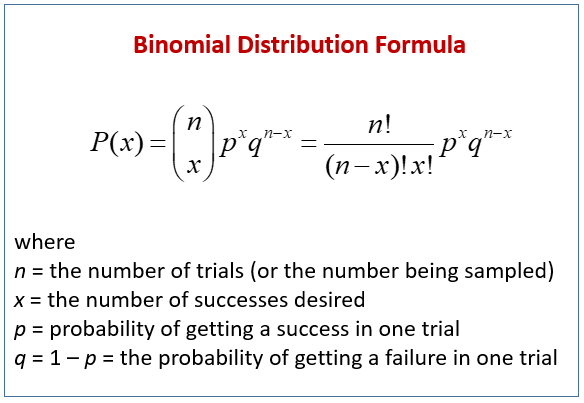 The following diagram gives the Binomial Distribution Formula. Scroll down the page for more examples and solutions. The following video will discuss what a binomial experiment is, discuss the formula for finding the probability associated with a binomial experiment, and gives an example to illustrate the concepts.